If you are one of those vapers who feel like they have seen it all and there is absolutely nothing that could ever come out that would truly surprise you, you're in for a real treat. This interesting and dynamic vaping device is going to allow you to be able to vape on the go with an ease and convenience that you have ever encountered before. Each pack of these draw activated, mouth to lung pod devices hold 1.2ml of juice that has 60mg of nicotine. Made with the use of salt nicotine, you are going to be able to get all of that intense satisfaction that you crave without missing a beat. Stig has a way of thinking up some of the most dynamic and interesting kinds of products that will keep you on your toes and so excited to see just what kind of amazing innovation that they will able to come up with next! 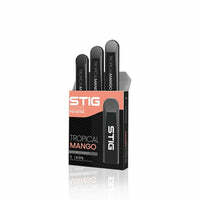 Tropical Mango Stig Disposable Pod Device - Stig has a rating of 4.0 stars based on 1 reviews.